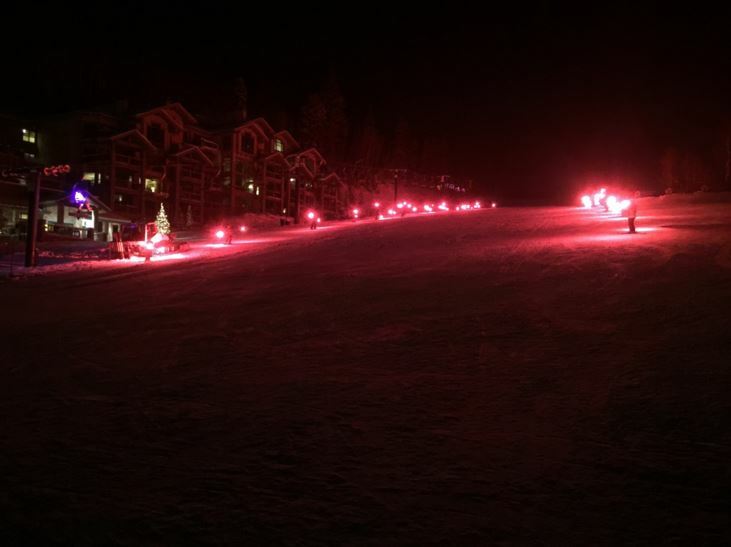 Deer Valley Resort’s Torchlight Parade from Deer Valley Resort on Vimeo. Cider, cookies and bragging rights—those are just three benefits of watching Deer Valley’s Torchlight Parade on December 30. Be sure to follow these steps to make your Torchlight experience a successful one. Step One: Disregard the thermometer. Braving the cold is worth it, not just for the bragging rights, but for the phenomenal experience. So, layer up. And when I say, “layer up,” I’m not talking about maybe throwing on a base layer and a pair of jeans. Bring out the big guns. Warmest base layers. Ski pants. Put stick-on toe warmers on your socks, inside of your warmest winter boots. Wear a neck gaiter, hat, and ski gloves with liners and hand-warmers. Step Two: Leave yourself plenty of time to park and walk up to the plaza. Complimentary hot cider and cookie stations will be set up in front of the ticket windows next to Carpenter Express chairlift (on the side facing the ski slopes), from 5:45-6 p.m. Step Four: Have your camera ready—not just for the photo ops with the mascots (see Step Three), but for an attempt to capture the magic of the evening. You’ll see a special team of ski instructors creating amazing formations on skis​ while carrying lit torches, all the way down Big Stick and Wide West ski runs. Truth be told, it’s hard to capture the torchlights, but if you need definitive proof for your bragging rights to having braved the cold for an incredible show, you’ll want to snap at least one photo or video clip. And, by the way, one of my favorite additions to this incredibly fun tradition is that Snow Park Restaurant stays open until around 7 p.m., so that you can gather with family and friends for a great meal before or after the festivities. Which is exactly what we did last year. And although we were cold, once inside and taking off our many layers, you could see by the smiles on everyone’s faces that we were, in fact, plenty warm. Will there be a Dec 31 fireworks show at Empire Canyon and where and what time is it? Looking forward to the torch light parade. We don’t have a fireworks show. Enjoy the parade on the 30th at snow park!